Garden Slippers offers seed grown plants so some variability in the look of some species as well as hybrids should be expected. The weather also plays a huge part in how these plants look from year to year; cool temperatures during the formation of the flower buds will give you dark flowers. This is especially true of dark purple-red hybrids and species. 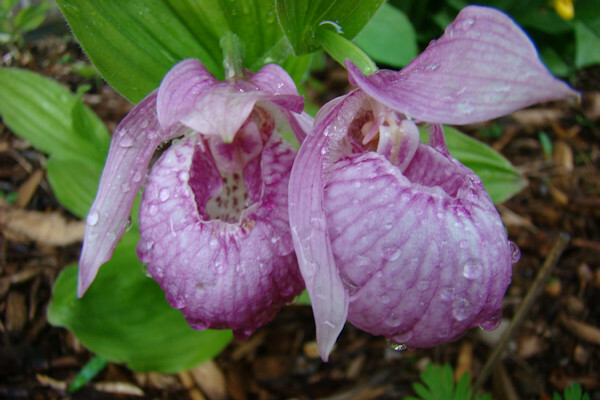 Cypripedium are not your average garden plants and as such they require different handling and treatment. After all, you want to protect your investment. We realize that people are in the habit of buying a plant in full bloom at the local Garden Centre then promptly ripping it out of the pot and jamming it between two of their garden favorites. We are guilty of this practice ourselves but with Cypripedium its best to remember that these are orchids and not your average garden plant. What works for most plants available commercially does not work for Cypripedium cultivation. The hybrids can endure, but this practice can be deadly for some of the less tolerant species. We recommend only transplanting while the plants are dormant. Garden Slippers attends sales as a vendor throughout Canada so please check out our Facebook page for updates. We are happy to deliver plants at any of the shows we attend. Just send us a plant request prior to the show. Pickups at the nursery are welcome but are by appointment only. Our plants are available for sale in April through to mid‑November. We recommend placing your plant request early to avoid disappointment as well as receiving your plants while still dormant and safe to transplant. Both shipping as well as availability are weather‑dependent and will be different from year to year. We are only able to transplant and ship while the plants are dormant. Plants are shipped using Canada Post. We are currently not able to ship internationally. Spring shipments start as soon as the ground thaws (usually early April). For Spring shipments we recommend using Canada Post's Xpresspost™ service. Pre‑orders start in February. There is no obligation to pay until time of shipping and you will be invoiced at that point. Shipping ends when the plants begin to grow in early May. There is a 6 – 8 week window for shipping in Spring. Fall shipments start in mid‑September. For Fall shipments we recommend using Canada Post's Regular Parcel™ service. Shipping starts mid‑September. New selections are available for shipping mid‑October. Shipping ends mid‑November. We charge a small fee for packing your orders and getting them to the post office. The fee covers the cost of the shipping box as well as packing materials like tape and styro peanuts. We also transplant into fresh dry media to ship an order to minimize the weight and reduce overall shipping costs. You will be charged $5.00 for the first plant and $2.00 per additional plant in your order. This handling fee will be added to your invoice as part of the shipping total. For shipments we accept cash, cheques, money orders, e‑transfers and PayPal payments. In person, either at the nursery or when attending shows, we accept cash, cheques, Visa and MasterCard credit cards and Interac debit cards. Many catalogue selections are only available in limited quantities. Therefore, please send us your list of desired plants and we will contact you with their availability. Once we receive your request we will contact you to confirm your order. We will discuss shipping or pick‑up arrangements as well as our quote including GST, packing and shipping costs. If the quote is to your liking we will send you an invoice and make arrangements for payment. Cheques should be made out to Shawn Hillis – our address will be on our invoice. Delivery will be made once payment has been processed. Success! Your order has been sent to us. Error! There was an error sending your order. For each plant, please specify the full plant name and quantity you'd like to purchase (e.g. Cypripedium Gisela - 4). Hint: To save typing in plant names, you can open the online catalogue, copy the plant name and paste it into the Order Details. © Garden Slippers. All Rights Reserved.